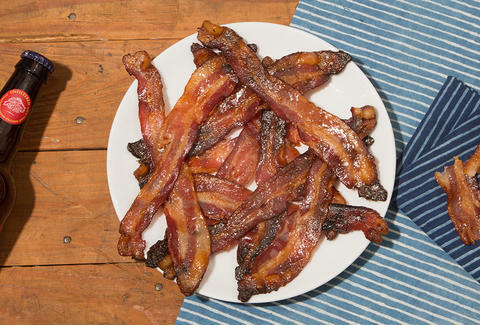 You’re an adult now, meaning you can have candy and hard cider for breakfast -- with thick, crispy bacon as their vehicle -- whenever you want. But how!? Good question. The answer: this recipe. With Crispin Hard Cider we combined sizzling bacon, brown sugar, hard apple cider, and some apple pie spices to create a delicate, sugary glaze to make the kind of candied bacon that will surely become a staple of any breakfast... or brunch or brinner, for that matter (because you're an adult, remember?). Combine the sugar, cider, and spices and set aside. Line the baking sheet with foil and place a cooking rack over the pan. Arrange the bacon on the rack, cooking for 10 minutes. 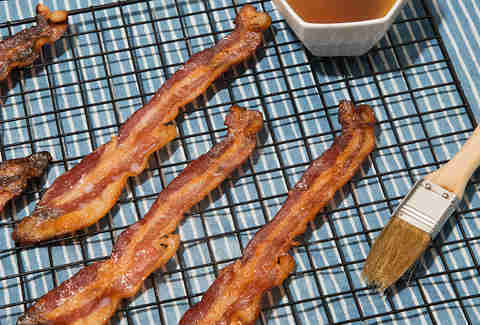 Brush the bacon with the sugar mixture. Cook another ten minutes until the syrup thickens atop the bacon. Cool until the sugar sets.